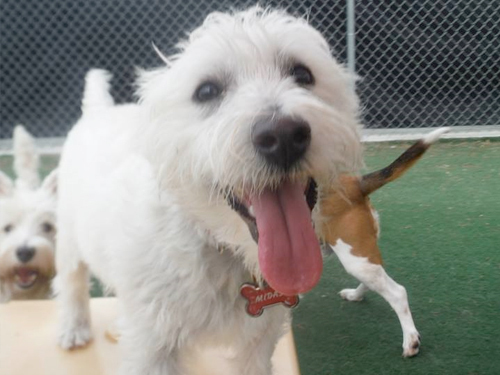 Midas is a rambunctious little Westie that has been with us only a short time, but he’s already made an impression. Midas loves to greet us with a “woo” whenever he sees us to show how happy he is to be here playing with his friends. Sometimes, you can catch a glimpse of his little tongue slightly sticking out of his mouth, which just makes him look cuter. Midas is always ready to play and it shows it by playing the entire day! We are excited to announce Midas as the Daycare Dog of May! Bama and Dixie joined our pack back in 2010 and have been making our hearts melt ever since. This dynamic duo is always up for some fun in Daycare or some cuddles and love. When Bama is not mingling with all of his friends in Daycare, he enjoys telling us stories about his day. He is one of our best story tellers! Dixie loves to run and play with every dog in daycare, but always makes sure to stop by for some people time. We absolutely love when these two come to visit us, and are sad to learn that they will soon be moving back to Alabama. We are so excited that Mom and Dad have been bringing them by more often to make sure we all get enough time with them before they have to leave. We wish you all the best of luck as you embark on the next chapter of your life and hope you all come back to visit us whenever you are in North Carolina. We will miss you Bama, Dixie, Mom and Dad!! Instead of a Cat of the Month for May, we decided to do Boomer, a black and white bunny that comes to see us often! Boomer spent this past Easter with us, which was more than appropriate, and came by again in the middle of April to spend some more time with us. This friendly and energetic little fellow has been coming to visit us for a little over a year now, and has made sure to spend both Easter Holidays with us. He loves to be pet and spend some time running around the room. He enjoys burrowing under his little house and is always sure to make us smile with his cuteness. We are excited to announce Boomer as our Pet of the Month for May! Joel joined our Suite Paws family in the Fall of 2013 and has quickly grown to be a major asset in our Daycare department. Most of our Daycare dogs have an extremely special bond with Joel; some have even tried to hop a fence just to go see Joel on the other side. He has a true passion for our Daycare dogs and his love for them is evident in his daily work. You may have seen some of Joel’s recent work with a GoPro in Daycare. He has carefully constructed a harness for the dogs to wear that has a GoPro attached to the top. Joel creates amazing videos from the pet’s point of view, capturing everything as they experience it in Daycare! You can check out these videos on our YouTube Page https://www.youtube.com/user/SuitePaws. When Joel is not wrestling with our pups here, he has “Starbuck”, the Aussie, and “Ollie”, the Border Collie, to romp with at home. We are so excited and proud to announce Joel as our Employee of the Month for the month of May. Congrats Joel! Keep up the awesome work!